Join us for a screening of RIKERS, a documentary about incarceration in America focused on Rikers Island in New York, then hear a panel discussion of the film. 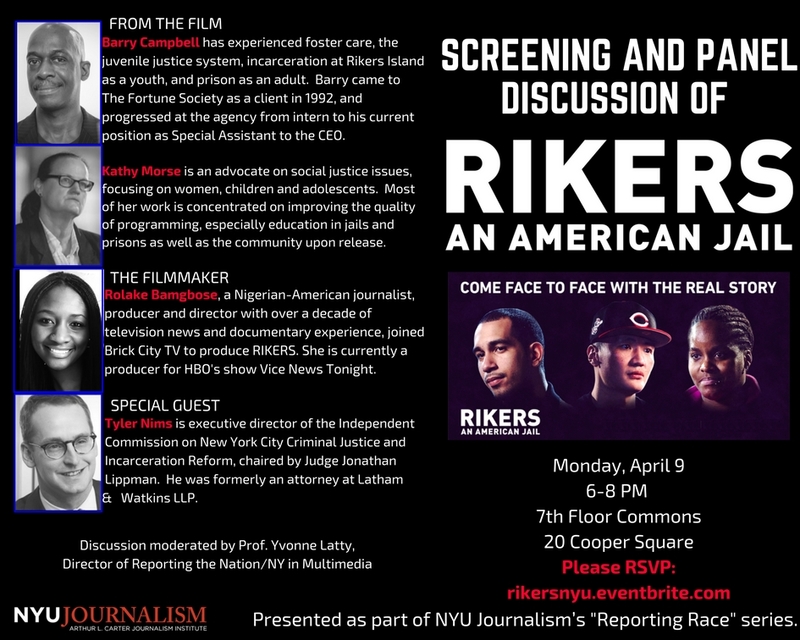 Join NYU Journalism for a screening of RIKERS, a documentary about what it means to be incarcerated in America — specifically at Rikers Island, New York City’s largest jail. Afterwards, listen as our panelists, who include former inmates, discuss the documentary — the issues it raises, criminal justice reform, and what’s next for the infamous Rikers Island and the 7,500 people detained there. Presented as part of NYU Journalism’s “Reporting Race” series. Kathy Morse is an advocate on social justice issues, focusing on women, children and adolescents. Most of her work is concentrated on improving the quality of programming, especially education in jails and prisons as well as the community upon release. Kathy holds Bachelor’s degree in Criminal Law and Justice from Rowan University (1981) and worked for over thirty years as a paralegal for numerous law firms in Manhattan. Currently she is the Volunteer Coordinator of the New York Region for the Petey Greene Program which supplements education in correctional facilities by preparing volunteers, primarily college students, to provide free, quality tutoring and related programming to support the academic achievement of incarcerated people in some of the same facilities in which she was detained. Based on her personal experience within the criminal justice system both as a paralegal and then as a defendant, Kathy has participated as a panelist at numerous events regarding women’s issues while incarcerated, specifically on educational programming, reentry issues, family reunification and mental health services in state prisons and city and county jails. Barry Campbell describes himself as a “systems baby,” having experienced foster care, the juvenile justice system, incarceration at Rikers Island as a youth, and prison as an adult. Barry came to The Fortune Society as a client in 1992 after serving 2 1/2 years in a NYS prison, successfully completed substance abuse treatment at Fortune, and progressed at the agency from intern to staff member to his current position as Special Assistant to the CEO. As Special Assistant, he fills a diversity of roles including advocacy on criminal justice policy issues, hands-on program service development, and work with individual clients. Barry brings both personal lived experience and broad professional expertise to his varied roles, and is a powerful and effective public speaker. Tyler Nims is executive director of the Independent Commission on New York City Criminal Justice and Incarceration Reform, chaired by Judge Jonathan Lippman. He is an attorney at Latham & Watkins LLP. He previously served as law clerk to US District Judge Raymond J. Dearie and Chief Justice Sandile Ngcobo of the South African Constitutional Court and practiced civil rights litigation in Chicago. In 2010 Bamgbose traveled to Haiti to film and report on the devastation following the country’s catastrophic earthquake. Her passion for travel and interest in cultural mores, especially the roots of socio-economic inequalities, has guided her dedication to tell stories of those marginalized by the mainstream media.